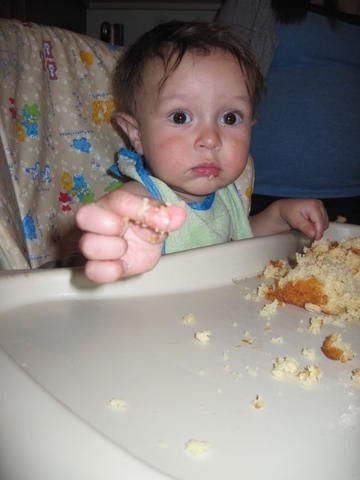 This is the second post in a two part series behind the scenes of Chazz’s first birthday. After all of the blood, sweat and tears that went into this party, I have to share a few things with ya! 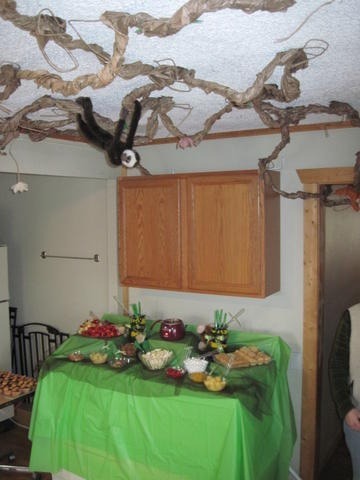 The first post covered the decorations for Chazz’s monkey themed first birthday party. This post will cover the yummy food and the sweets buffet! The Colors: Brown & Jungle Green, Blue accent. 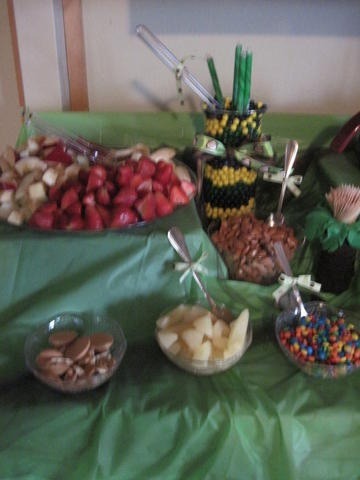 I really wanted to do a candy buffet for this birthday. 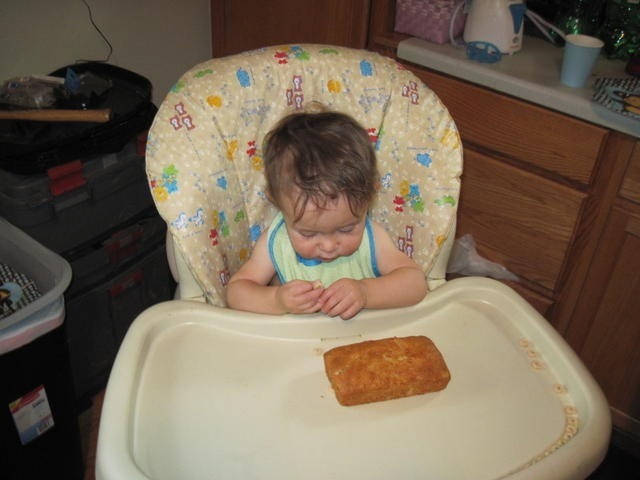 It seemed light and fun for a child’s first birthday. 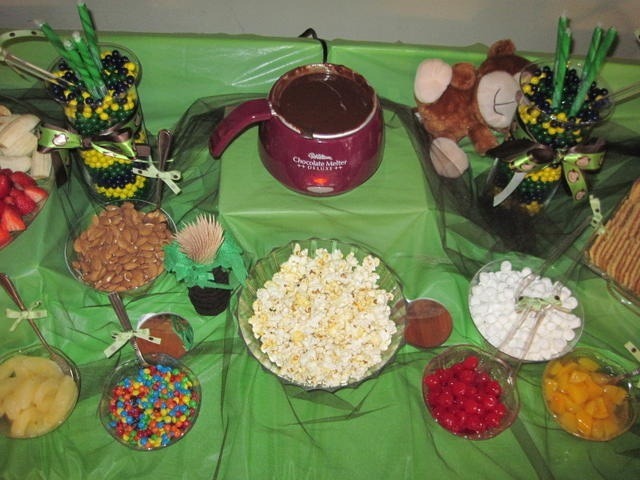 And that eventually grew into a sweets buffet, as who can say no to chocolate fondue?? Not I! 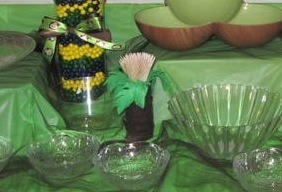 I set up a table with a green tablecloth and brown tulle. I used shoe boxes underneath to raise up some platters and add depth. 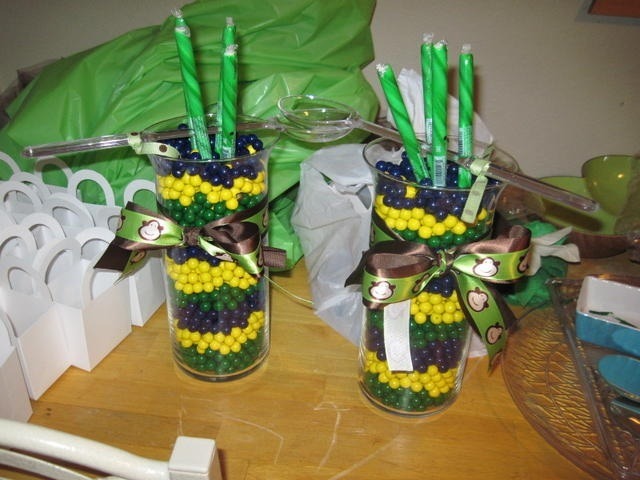 I added coordinating ribbon to the vases and various scoops. And look! There are some decorations I told you about in Part One. I got it locally at the candy shop. They gave me a bulk discount, yay! $6 a pound for 6 pounds of Sixlets. (I figured about a 1/4 pound per guest.) They didn’t have brown, so I had to work in some yellow. I’m trying not to be upset about it. A variety of fruits, cookies, and treats were harmed in the making of this partay. The pot? Wilton, $20 bucks. The Chocolate. That’s Wilton too. $WayTooExpensive. But oh so good. And of course, more cookies and such. I used good ol’ yellow boxed cake (shhh!) and added a 11/2 cup of mashed banana. Chocolate frosting, nilla wafers, red gel frosting, and M&M’s make the Monkey face. 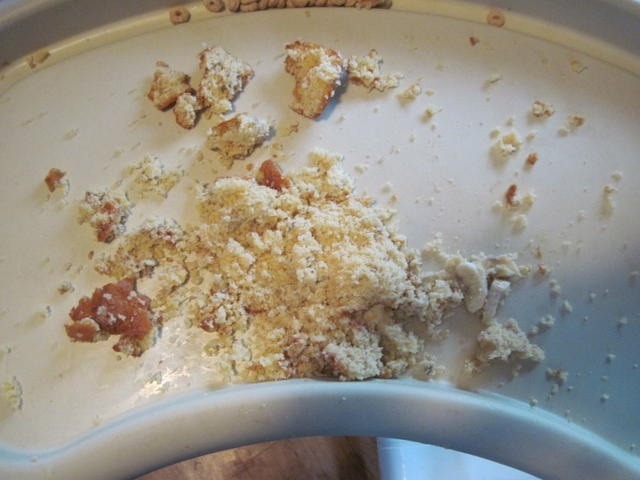 With pureed bananas. And he even added a cheerio on top. After all of the blood, sweat, tears, and planning that went into Chazz’s First Birthday party, it’s time for a birthday tour. 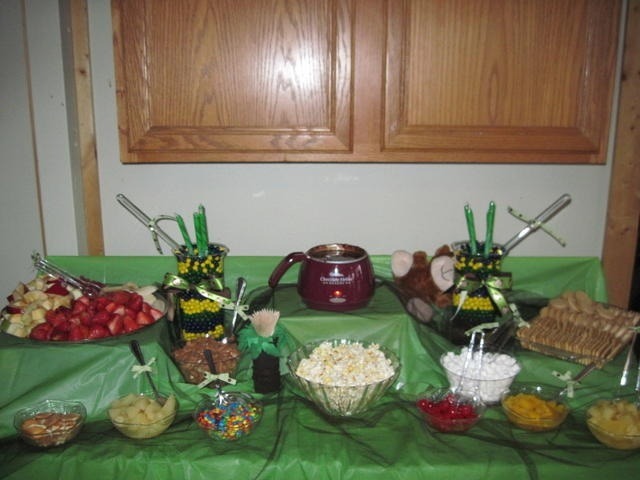 All the inside scoop on his monkey birthday party and jungle theme. 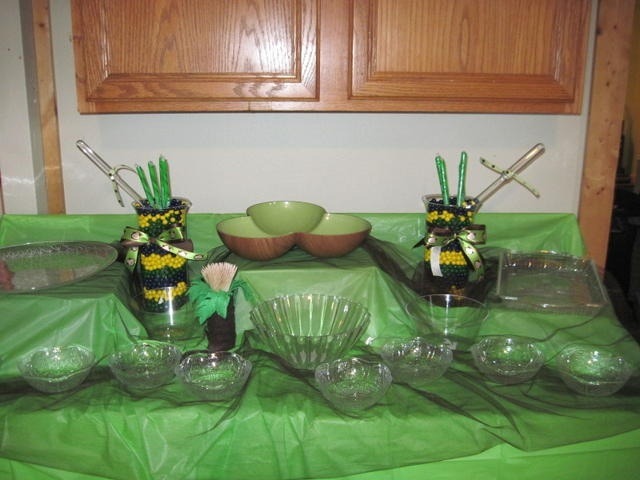 This post will cover the details and the decorations for Chazz’s monkey birthday party. 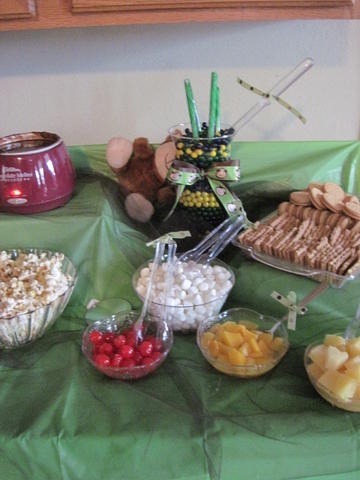 There will be a second post to cover the yummy food and the candy buffet. I was deadset on turning our kitchen into a jungle, so we saved all of our paper grocery bags for months to twist into fake jungle vines. 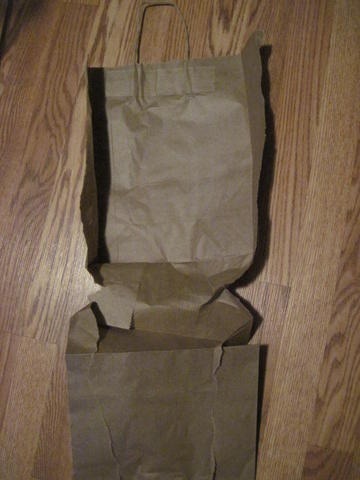 I tore down each side of the paper bag, and crinkled them up to get a good texture. 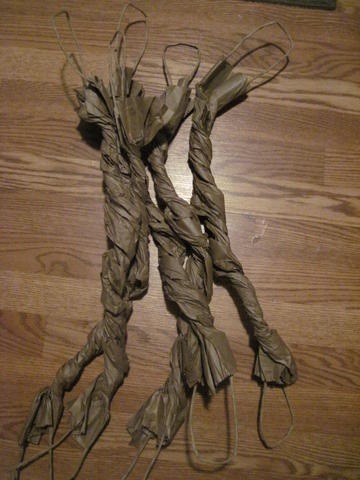 I twisted them to look vine-y and used the twine handles to wrap around the vines. I attatched felt leaves and a few flowers with good ol’ Glue Dots. Pin a few thousand to the ceiling, and Voilá! Insta- Jungle. 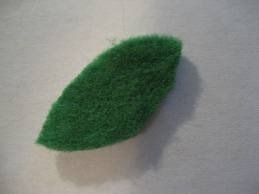 I cut the leaves out of felt. To give them more shape I tugged on the edges with a little twist to make them life-like. I was more than lucky to find a ton of monkey and jungle type stuff locally. Wood monkey and palm tree cutouts and bamboo mats all added to the theme. And course, nothing is complete without adding a little coordinating ribbon. JoAnn’s had the cutest monkey ribbon. I also made a mini palm tree out of a tp tube and brown and green felt. And lots and lots of glue. It was perfect for holding the toothpicks. I slipped the tree/tube over a salt shaker to raise up the toothpicks. I foung clear bags in packs of 12 at the dollar store! A freakin’ steal if you ask me. Just a simple something-something to take home candy in. It’s important to carry your theme throughout the entire party to tie it all together. Everything was monkeys. From the invites and coordinated ribbon, to the cupcakes, right down to the stuffed monkeys hanging out through the house. See the candy buffet? Yummm! 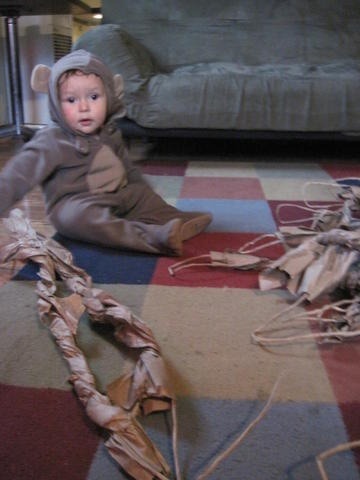 I had so much fun planning and decorating for our own little monkey. I would say “I can’t wait” for his next birthday, but I SO can, haha. You can look for the second part of Chazz’s birthday tour this week. Come back and drool over monkey cupcakes, candy buffet ideas, and chocolate fondue! Our Little Monkey is finally ONE! Chazz’s first birthday was amazing. The Birthday Boy “monkey’d around” (haha…) all morning eating cheerios and bananas while we finished putting together the jungle vines. 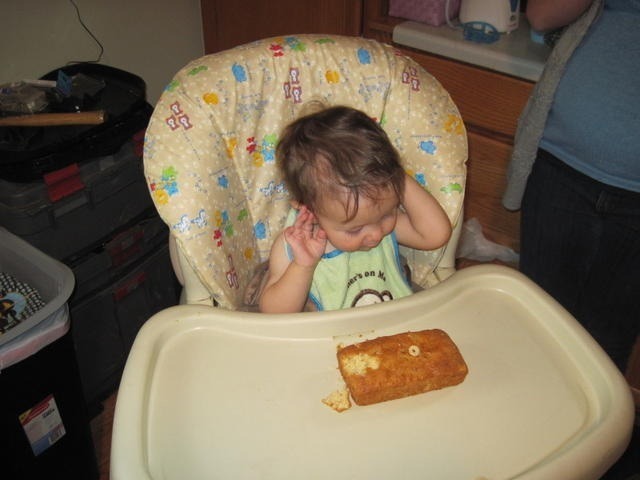 We were starting to get a little worried, as he was getting really fussy and refused to nap. Disaster in the making! So Roman and Chazz went on a quick drive to get him to pass out. Works like a charm. When they got back he slept for 2.5 hours, and right through the first half hour of his own partay! Talk about fashionably late. But since I didn’t think he’d mind, we dug into the sweets buffet anyway! 🙂 Which turned out wonderfully, by the way. And it was a lot of fun to put together. The chocolate fondue was omigosh amazing, with fresh fruits and various cookies and treats to dip. Oh, and about six pounds of Sixlets. Fun fun. 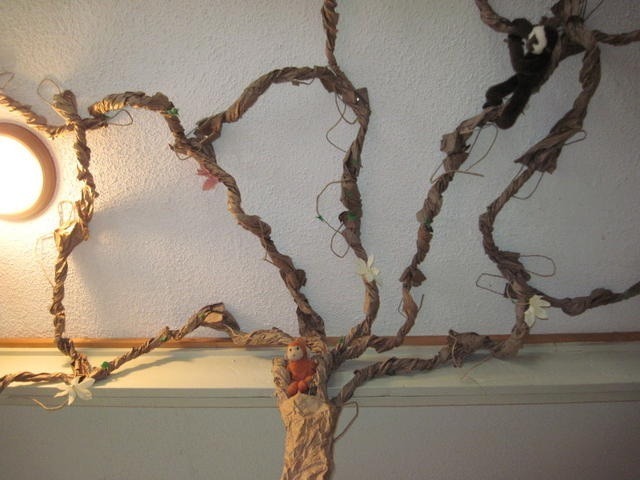 Here is a peek at the jungle vines (how-to post still to come!). 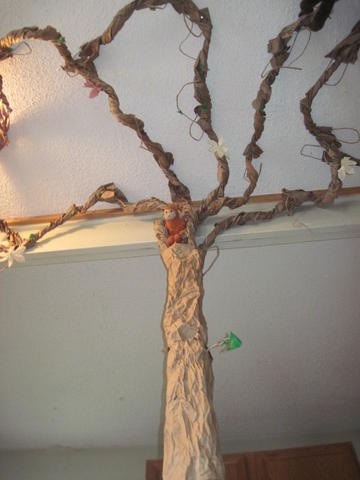 I made them from twisted paper bags with felt leaves and fake flowers. And a lot of monkeys! 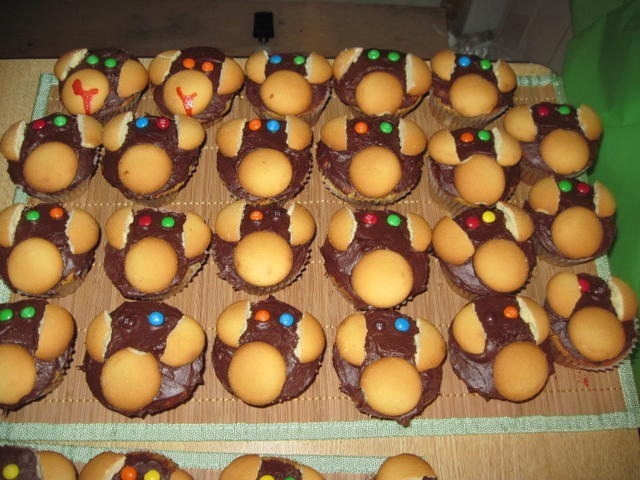 When Chazz finally awoke, we served up the monkey cupcakes. And served The Monkey his own personal (egg-free, frosting-free) banana cake. Mmmm! With a cheerio on top, per Head Chef Chazz. 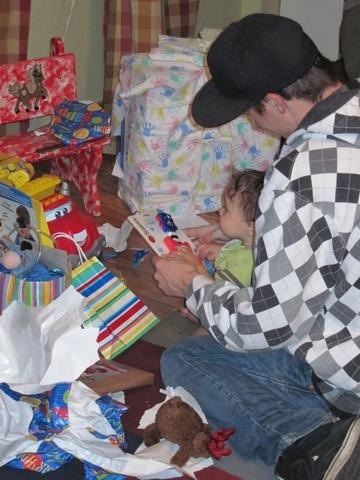 Then it was off to open gifts with a little help from dad. Chazz got a lot of fun books and toys, clothes, and even a chair just his size. 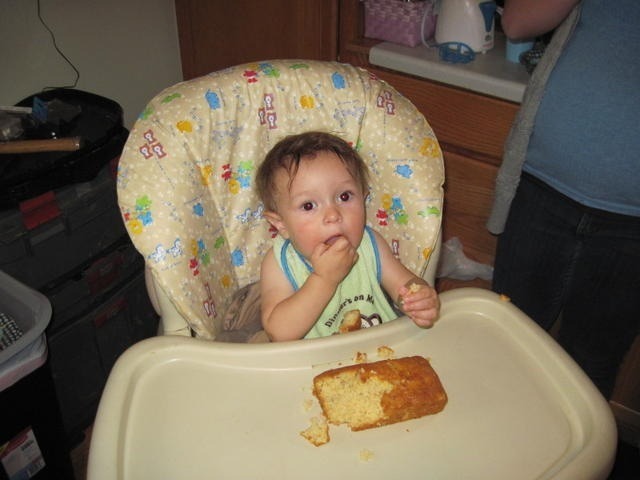 What a lucky little man on his first birthday. We were surrounded by family and friends to celebrate one year of crazyfun. I can’t believe how fast this year has gone, how much Chazz has grown, and how far we’ve come as a family. Happy Birthday Chazz-man! I couldn’t have asked for a more perfect “you”! Stay tuned for an inside look at the decorations and food and a how-to post! You can leave a comment (please do! ), read more about us, or even vote for Forever&After by clicking the banner below.